Aquadeck® is a producer of high-quality, exclusive pool covers, made from slats, that safely and stylishly cover your pool. Aquadeck® is located in Budel, the Netherlands. Professionalism, all-round hospitality, the guarantee of top quality, excellent service, and comprehensive support are key values that are consistently lived up to and delivered by Aquadeck®. The entire production process of Aquadeck® pool covers take place in our own production facilities. Every cover is made to measure. An experienced team of skilled professionals guarantee dedicated care and attention for the manufacturing of your pool cover. Aquadeck® is a state of the art product: stylish and technologically advanced. The cover is also a perfect solution to avoid leaves, dirt and insects. Due to the different installation options, you easily integrate the stylish cover in both existing or new pools. Aquadeck® is a forerunner in the field of technology and innovation. The unique anti-algae system keeps the slats clean. Moreover, the insulating effect of the slats provides a pleasant water temperature. This effect is even strengthened if you install the solar slats, resulting in significant energy savings. 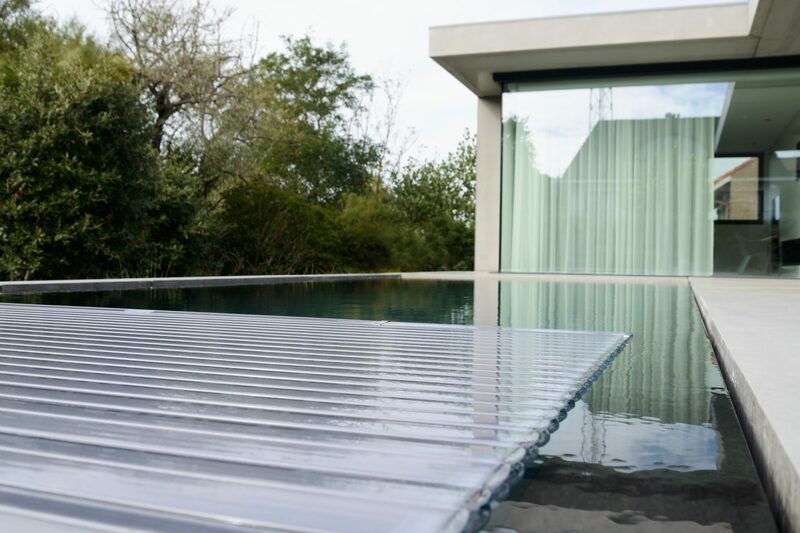 Thanks to innovative groove technology the water is refreshed and circulated inside the slat, so that the water treatment system breaks down and removes algae. For our professional customers we launched the Aquadeck ordertool. You can configure your cover online, calculate your prices and order. With most manufacturers of pool covers, you have to wait five or six weeks. Not with Aquadeck. Thanks to continuous innovation, we’ve the perfect combination of technology and logistics. A strong brand is backed by a strong company. With Aquadeck you chose for top quality. We have extended warranty conditions on technique up to 4 years. On top of that you get 2 years warranty on PVC and 5 years on PC slats. That’s how much confidence we have in our products.